As the Principle Creative I did a complete new brand development from start to finish for the top 20 producers of Variable Annutiies. This marketing campaign won the Award of Excellence from IFCA. As creative lead I felt transforming the out-dated design into a modern design was key to the success of this campaign. Keeping with the AIG brand I pushed the edge of the box slightly by using color transparencies/multiply effect to create secondary and tertiary colors. I kept with geometric shapes and san serif typography to accentuate the modern brand look. 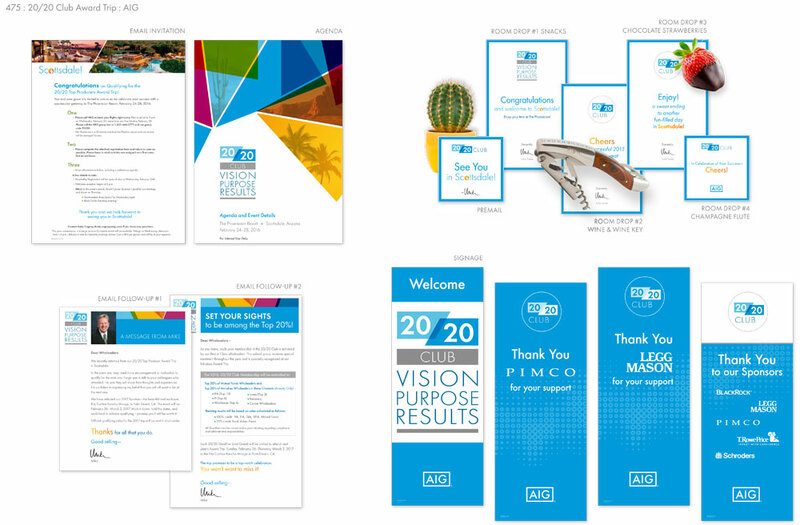 The rebrand included: logo design, notecards, exhibit booth, conference signage, speciality gifts, emails, print materials, etc. It was highly by senior executives and were “wow”ed with the overall execution.